Cartoon showing wind-blown plastic bags caught in the branches of a tree. Cartoon about the hour changing, and the effect that the dark evenings have on gardeners when clocks go forward. 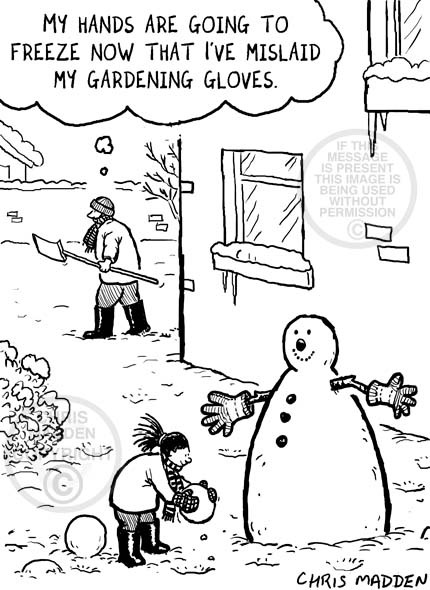 Cartoon of a gardener when the clocks go forward in the autumn and when it gets dark an hour earlier. The gardener’s wife is saying that because of the dark evenings he can spend the time that he would have spent in the garden decorating the house instead. 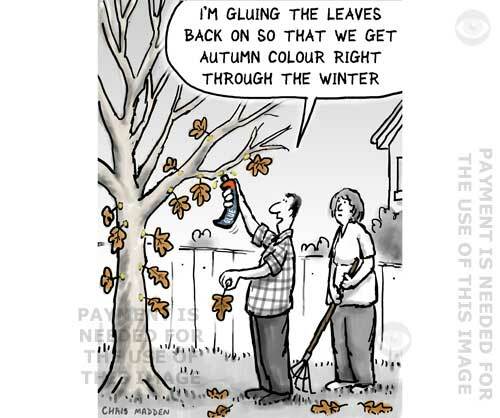 Autumn or fall gardening cartoon – gluing the fallen autumn leaves back onto a tree. The leaves are being stuck back onto the branches of the tree with glue so that the branches aren’t bare during the winter and so that the trees can provide some winter colour in the garden. Cartoon showing someone tidying his garden by gathering and burning autumn (fall) leaves. The smoke from the leaves is blowing in his face, ruining the effects of the fresh outdoor air.